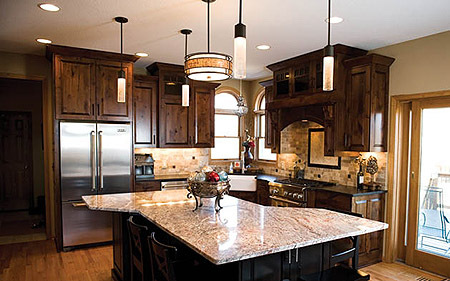 Parade of Homes Remodelers Showcase Fall 2013 | Maple Grove, Minnesota | Great Room - Family Room and Kitchen Redodel. Scope: Wow, TJB Homes, Inc. is back! The home was purchased as a model in 1997, 16 years later and the homeowners ready to rejuvenate the Kitchen, Dinette & Dinning room. The project consists of removing the wall separating the kitchen from the dinning room, removing the dinette and placing a Gigantic 10 stools center Island, all cabinets will be finished in Rustic Alder with every bell & whistle one could ever want! Hearth Kitchen design with stepped 54" uppers, charging center, furniture style custom cabinets, Granite tops with subway tile backsplashes. This is not one to miss! TJB Homes is also a featured Remodeling contractor for DIY's, Bath Crashers! 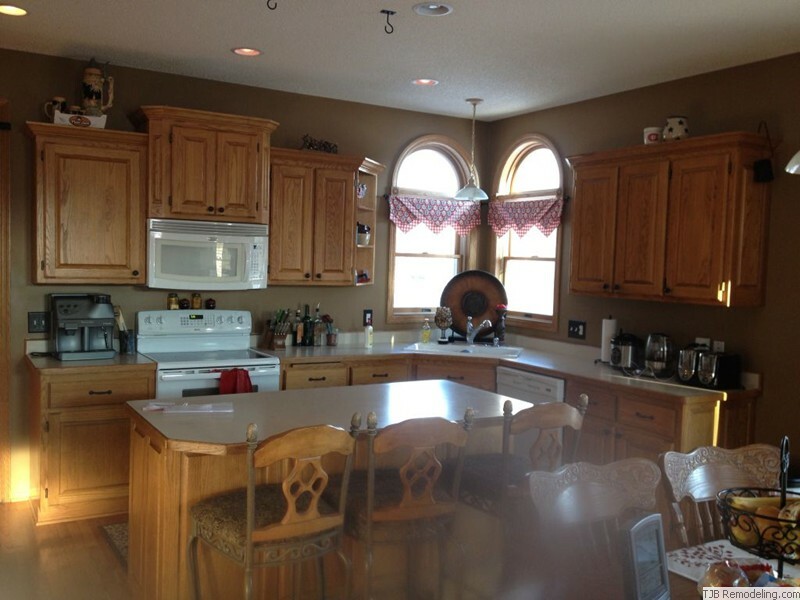 Homeowners Jerry and Jane Bergstrom renovate their Maple Grove kitchen. The rich colors and updated amenities of the strongergstrom remodel serve the needs of the family of five that likes to entertain. 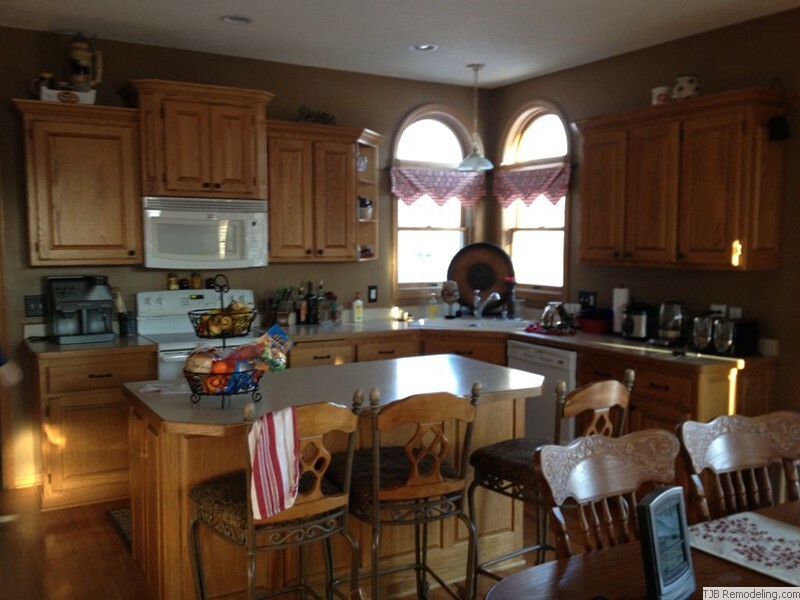 Many say the kitchen is the heart of the home, the perfect gathering place for meals and conversation. Yet, perhaps more so than for any other room, it must also be functional. After 17 years in their house, Jerry and Jane Bergstrom decided their kitchen and adjoining dining room no longer fit their family. The space needed an upgrade. Ultimately they partnered with Jason Budzynski at TJB Homes to bring their vision of rustic chic to life. Although the Bergstroms, including 24-year-old Andrew, 21-year-old Austin and 18-year-old Allie, purchased their Maple Grove home in 1997, they only lived here for 5 years before Jerry was transferred to Canada for 2½ years for his job with General Mills, so the family rented out their Minnesota home during that time. 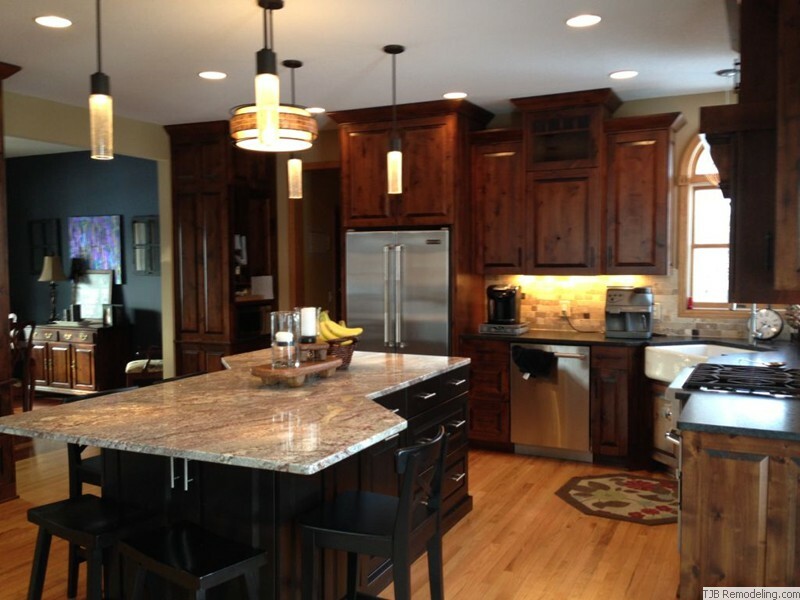 They returned to Maple Grove and to the same kitchen they knew needed an upgrade. 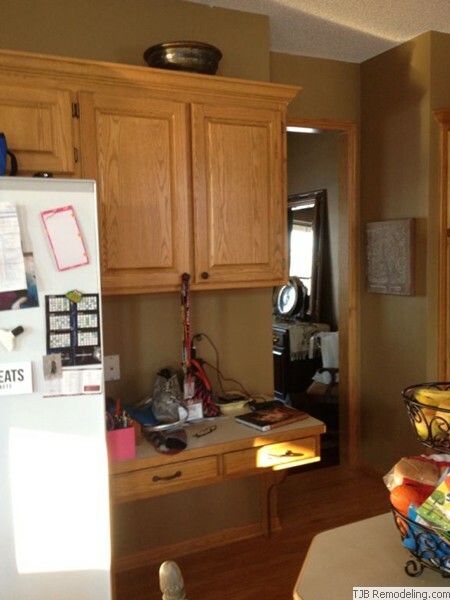 The couple originally had the idea to give their kitchen a simple facelift by replacing the countertops. But once they began to collaborate with contractors, their ideas grew. After initial quotes from seven different remodelers, they narrowed the field and asked for a second round of quotes and more complete design plans. They based their decision on three criteria: price, design and their ability to work well with the contractor. They chose TJB Homes. Budzynski kept the project on track and on budget, and Jane appreciated his valuable suggestions. "We had a real blast from the beginning stages, from the first meeting to the last meeting," Budzynski says. When brainstorming her dream kitchen, Jane says she was searching for a family-friendly space, but also a spot to entertain. The couple hoped for a less formal and more relaxed dining room. From top to bottom, the entire family was thrilled with the spectacular results. 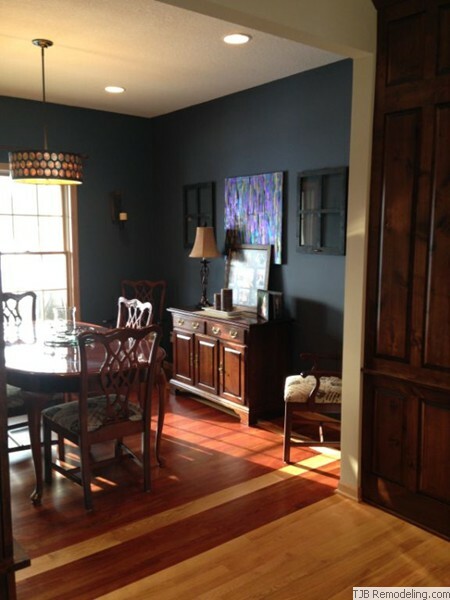 A move towards darker wood tones accommodated the family’s traditional, yet slightly craftsman style. Refinished oak floors remained to complement the new, rich chocolate-colored knotty alder cabinets and swirling granite countertops. New stainless steel appliances included a gas range which Jane welcomed. The space was reconfigured and opened up by removing a wall to allow for the installation of a farm sink. New lighting highlights the beauty of the new features, and the family’s previous furniture, including their dining room table, found a cozy new home in the space. Storage was also added through a built-in media cabinet. But the best part of the new kitchen? 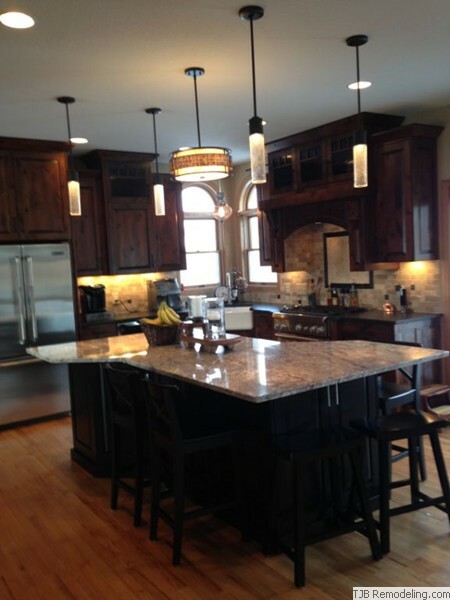 The Bergstroms agree that the large island, which eliminated the need for a kitchen table, is a favorite feature of their renovation. "It is an interesting jagged shape, opposed to an ordinary rectangle," Jane says, "We just love the conversations we have around the island." Ultimately, Budzynski worked to give Jane and Jerry their dream kitchen with top-notch amenities and a rustic flair, but it is the relationship, Budzynski believes, that is the most important thing to consider before embarking on a renovation. "Remodeling is a partnership. You have to be able to work with your contractor," he says. The Bergstroms checked off each box on their wish list, and successfully transformed their vision into reality.